Here is Samuel Rutherford facing the question – if all are not elected, redeemed, loved savingly, how can I trust in Christ, is it not presumption unless I know I am elect? I’ve been writing up the last chapter of the dissertation this past fortnight – it focuses on Sedgwick, Manton, Rutherford and Dickson. A bit to go yet but lots of good material on the free offer from these four individuals to include. As an aside Rutherford’s statement that the reprobate have “as fair a revealed warrant to believe, as the elect have” was well used by the Marrowmen in their defence of the gospel offer. Reformed theology, of course, is not contrary to reason, but neither is it rationalistic. And that is a happy balance. Evangelical theology has disintegrated in the past 60 years to the extent that catholic doctrines (i.e. doctrines of the church universal) can be denied, and one can remain an evangelical statesman. For more on this vital topic see Shedd’s The Doctrine of Eternal Punishment. Hell is not an easy subject, it is not a topic that should be broached without tears in our eyes and a heart that burns with evangelistic zeal (2 Cor. 5:11). But as it is not a topic that can be avoided, or denied, without grave consequences. PS If you have never read Shedd’s “Orthodoxy and Hetrodoxy” you are missing a treat. Think of a 19th century collection of essays in the style Carl Trueman’s little books. Shedd’s essay “Liberal Bigotry” is priceless. In general in the chapter Murray takes people on a journey. He begins by defining the gospel and the scope of the gospel – which is undeniably for “all men, everywhere.” He then explains the heart of the gospel which is the atoning death of Christ and the reason for the provision of the death of Christ – the love of God. 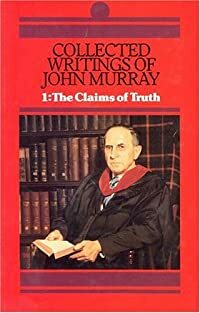 After considering a general love of God for all, and some general benefits with flow from the atonement to all, Murray defends the particular electing love of God and a definite (particular) redemption. This leads to the question Murray has been building up to all along – “How can the gospel be universal when the electing love of God, and the redemption of Christ are particular?” His answer: the gospel does not call us to faith in the electing love of God, or the extent of the atonement, but to Christ as he is offered to us in the gospel. Anyway here are the questions with more thoughts to follow hopefully over the course of the week. 2. To whom is the gospel sent? (p59-60) What are the implications of this? How do we, and how does CPC live these out? 3. Why might a passion for proclaiming the gospel be lost? (p59). Do we have that passion? What can we do to stir that passion up in us? 4. What is the basis for the universal preaching of the gospel? 5. What is the source of the atonement? (p62). 6. What do we mean by atonement? (p62). 7. Murray gives scriptural reasons for believing in “the love of God for the ungodly, the unthankful and the evil” (p66). What does this mean for us e.g. our attitude to those outside of Christ? Life (family, church, work) has been very busy! All the desirable delicacies of the soul are treasured up in the Covenant of God’s Grace; in it are contained all the gracious attributes in God, all the gracious affections of God, all the gracious relations of God, all the gracious promises and engagements of God. There you find the reconciled God, the merciful God, the pardoning God, the sin-subduing God, the strengthening and helping God, the guiding and upholding God, the blessing and comforting God; you cannot think of a mercy for the soul, of a mercy for the body, of a mercy for this life, of a happiness after this life, but there it is, but there it is for you, but there it is assuredly for you.